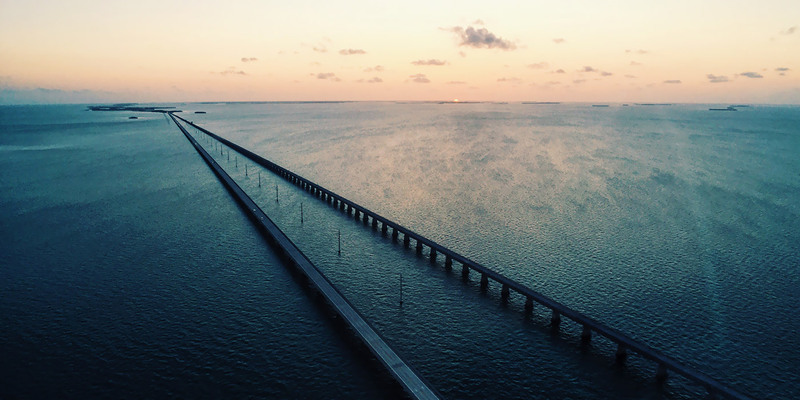 The Route 1 drive over The Florida Keys is among the nation’s most scenic drives. Hopping from one pint-sized island to the next – the waters of the Atlantic to the east; the calmer waves of the Gulf of Mexico to the west – is serene in a way that only Jimmy Buffet can fully appreciate. But arguably the best way to experience the Keys is from the air. Which is how we found ourselves aboard a helicopter sunset flight with Viator (yet another great tour that was part of our participation in Viator’s Ambassador Program). Last year’s flight over the Canadian Rockies was, in a word, unforgettable. Our latest flight provided an altogether different, but every bit as memorable, experience. Pulling into the tiny Marathon Airport, we found it closed. Every day at six o’clock sharp, they lock the doors. There is no air traffic control tower. One can only surmise this is due to the lack of, ya know, traffic. Pilots instead rely on the skill and judgement of their fellow pilots to keep everyone abreast of their plans (fingers crossed …). All of which is to say: it’s small and pretty laid back. But our pilot, Mike (no relation), met us at the reception area with his dog, Shane Dog. In keeping with the no-frills Florida Keys ethos, prior to our tour, there was no paperwork to fill out, no lengthy check-in process, no safety briefing … no real briefing at all actually. From there, we walked a few hundred feet to our waiting chariot. The bright, canary yellow bird seated only four people, including the pilot, and was every bit as low-key as Marathon itself. In-flight amenities included two cupholders, an ashtray, and seatbelts (“Please don’t let the straps flap around outside the door or they might dent the fuselage.”). There was no AC and there would be no in-flight meal service. It’s hard not to be giddy before a helicopter flight! Sunset. Florida Keys. Enough Said. From the ground, the sea, the Florida Keys never disappoint. But, this was the first time either of us had experienced the island chain from the air. In a few short minutes, we were gliding over the famous Seven Mile Bridge. Mike pointed out schools of eagle rays, a turtle, and either a manatee/dolphin/small submarine — we’re still unsure — all loitering around the bridge. Circling over Pigeon Key, we spotted a tour group who couldn’t grasp why this tiny whirlybird was hovering so close above them. After a few quick twirls downward, we were close enough to wave and smile at them, which the group immediately returned. Because, really, who doesn’t like helicopters? Even at low altitude (500-ish feet), it’s amazing just how far we could see. The Keys are a sizable archipelago but, from the air, they seem so compact as if you can capture the entire chain in a single photograph. It’s easy to see why the Pigeon Key folks were apprehensive at first. Time flies when you’re, well, flying and it’s amazing how quickly twenty minutes go by. Viator also offers a 60-minute flight and I think we’d opt for that next time. While it might seem like a once-in-a-lifetime bucket list experience, Kelsey and I would do it again in a heartbeat!